Please select an option 5 6.5 7 7.5 8 8.5 9 9.5 10 10.5 11 11.5 12 12.5 13 Please select a ringsize. The Black Tungsten Carbide Wedding Rings Set is made from tungsten carbide, a scratch-resistant and hypoallergenic metal, comfortable to use every day. The ring weighs a little to make you feel your partner's love to you even if he/she is not beside you all the time. It is also a great reminder that your partner might need some flowers or food to help cheer her/him up after a long day. The ring is a perfect anniversary gift for your partner with its sophisticated design and long-lasting shine, just like your relationship with your partner, forever. 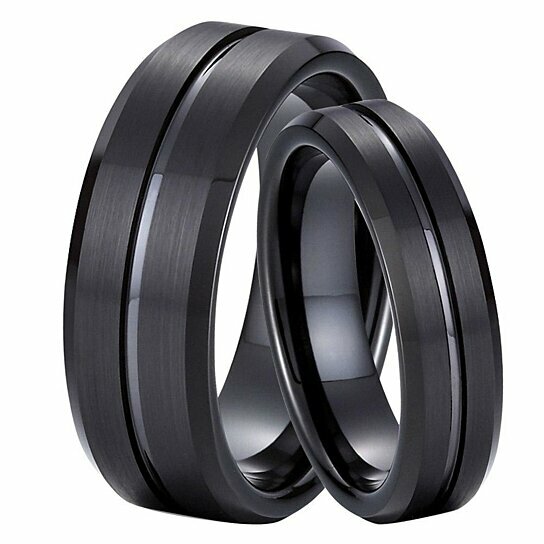 Buy two, one for yourself and another one for your other half, for Black Tungsten Carbide Wedding Rings Set, is a nice way to show your love and appreciation to your partner.